"I raised her the way I thought best." 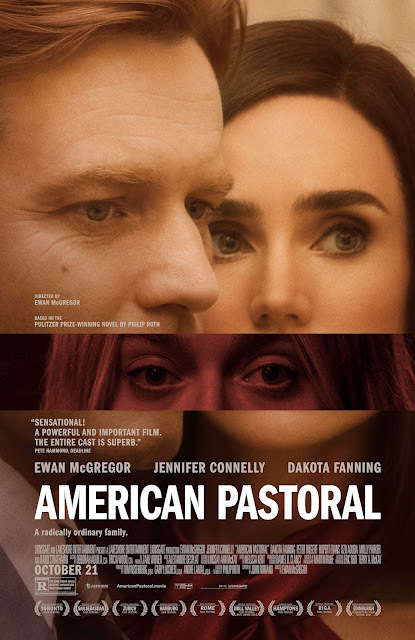 That's an emotionally devestating quote from Ewan McGregor in American Pastoral, the greatest & most underrated film of the year so far. The film is based on the 1997 Pulitzer Prize-winning novel of the same name by Philip Roth. McGregor plays Seymour "Swede" Levov, a legendary high school athlete at Weequahic High School in Newark, New Jersey in the 1940's. His nickname, "Swede", came from his Scandinavian looks, an anomaly in his Jewish family. He was a hero in his predominantly Jewish neighborhood, especially to Nathan Zuckerman (played by David Strathairn), who narrates the film. After World War II, he marries Dawn Dwyer (played by Jennifer Connelly), a former Miss New Jersey. They then move to the suburb of Old Rimrock, & have a daughter, Meredith (played by Dakota Fanning), who has an extremely debilitating stutter. Also, Seymour runs a successful glove manufacturing company in Newark, with help from his secretary, Vicky (played by Uzo Aduba). Everything is going great for Seymour, Dawn, & Meredith. They are living the perfect American life. Eventually, things change. It's the 1960's. The country is in the midst of the Vietnam War, & racial unrest is occurring in Newark's inner-city. But the biggest problem is Meredith, who has become involved with a Weather Underground-esque group, & hates both Seymour & Dawn. Eventually, as she disappears, the post office in Old Rimrock is bombed, killing one person. As the authorities start to investigate her disappearance & her alleged involvement in the bombing, Seymour's life starts to fall apart, making him wonder if everything was perfect in the first place. The cast was spectacular, especially Fanning, whose role is so different from her previous roles in her childhood, & Strathairn, who has always been an excellent & underrated actor. McGregor's direction is perfectly minimalist, shining in his directorial debut. John Romano's screenplay brings an excellent novel to the screen in an amazing fashion. Alexandre Desplat's score is nothing short of excellent. And Martin Ruhe's cinematography is breathtaking. This is a perfect adaptation of Philip Roth's novel, & also criminally underrated.